Download "MOORLAND SURGICAL SUPPLIES LTD INFORMATION GOVERNANCE POLICY"
1 MOORLAND SURGICAL SUPPLIES LTD INFORMATION GOVERNANCE POLICY Moorland is committed to ensuring that, as far as it is reasonably practicable, the way we provide services to the public and the way we treat our staff reflects their individual needs and does not discriminate against individuals or groups on the basis of their age, disability, gender, race, religion/belief or sexual orientation. 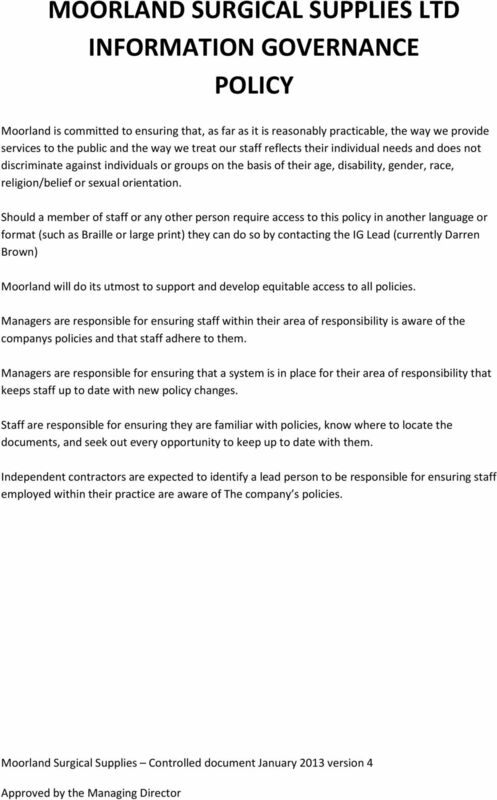 Should a member of staff or any other person require access to this policy in another language or format (such as Braille or large print) they can do so by contacting the IG Lead (currently Darren Brown) Moorland will do its utmost to support and develop equitable access to all policies. Managers are responsible for ensuring staff within their area of responsibility is aware of the companys policies and that staff adhere to them. Managers are responsible for ensuring that a system is in place for their area of responsibility that keeps staff up to date with new policy changes. Staff are responsible for ensuring they are familiar with policies, know where to locate the documents, and seek out every opportunity to keep up to date with them. Independent contractors are expected to identify a lead person to be responsible for ensuring staff employed within their practice are aware of The company s policies. 2 CONTENTS 1 INTRODUCTION 1.1 Scope 1.2 Principles 2 INFORMATION GOVERNANCE POLICY 3 IMPLEMENTATION 3.1 Openness 3.2 Legal Compliance 3.3 Information Security 3.4 Information Quality Assurance 3.5 Year on Year Improvement Plan and Assessment 3.6 Roles, Responsibilities and Accountabilities 3.7 Training 3.8 Contacts 3.9 Monitoring and Compliance 4 REFERENCE DOCUMENTS 5 GLOSSARY 6 APPENDICES Appendix 1 Legislation and Guidelines 12 Appendix 2 Information Governance Related Policies 13 The company s Information Governance Policy The current version of this policy is held with the company s IG lead and within the SOP, plans are to me made to add this to the company s intranet. 4 has day to day operational responsibility to promote and implement compliance with the Information Governance framework. 1.2 Principles Information Governance ensures that one of Moorlands most important assets, information, in both clinical and management terms, is respected and held in a secure and manageable conditions. 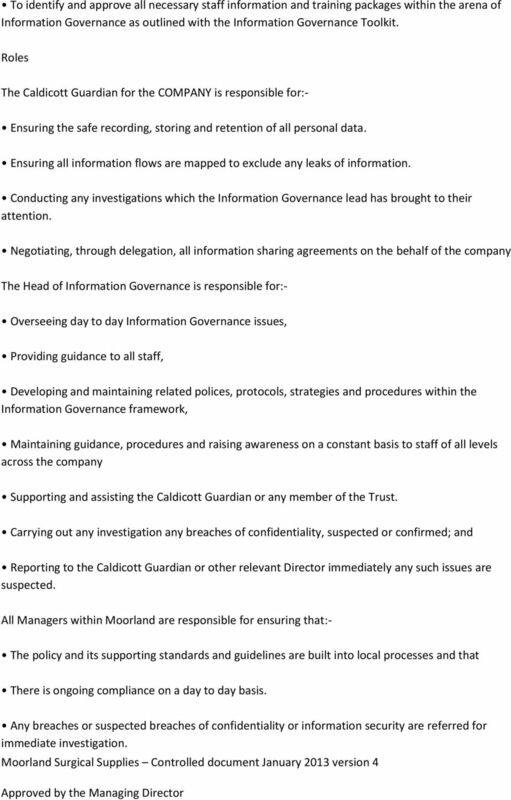 It is therefore of paramount importance to ensure that information is efficiently managed on the basis of the HORUS Categorization: Held safely and confidentially Obtained fairly and effectively Recorded accurately and reliably Used effectively and ethically Shared appropriately and lawfully Moorland has put into place a range of appropriate policies, procedures and management arrangements to provide a robust framework for Information Governance. It will maintain polices and procedures to ensure compliance with the requirements of the NHS Connecting for Health Information Governance Toolkit. 2. INFORMATION GOVERNANCE POLICY The Information Governance (IG) agenda is driven by Department of Health (DoH) policy that, itself, is derived from a need to comply with obligations imposed by key data handling legislation. These are, primarily, the Data Protection Act 1998 and Freedom of Information Act 2000 but include other relevant legislation (see Appendix 1). These statutory obligations are supplemented by further DoH/NHS policy recommendations that define the scope of the IG agenda and all obligations placed on NHS trusts by it. This policy is driven by a recognised need to handle both personal and corporate information in an appropriate manner through the creation and maintenance of an internal IG framework. A suitably robust IG framework will: Contribute to the delivery of compliance, as defined Ensure all aspects of information quality in the delivery of healthcare services to local citizens, and The appropriate use of corporate data for COMPANY purposes. Annual completion of the NHS Connecting for Health IG Toolkit is the backbone of evidence provided by the Company which enables measurement of current data handling standards and any improvements made to them, year on year. 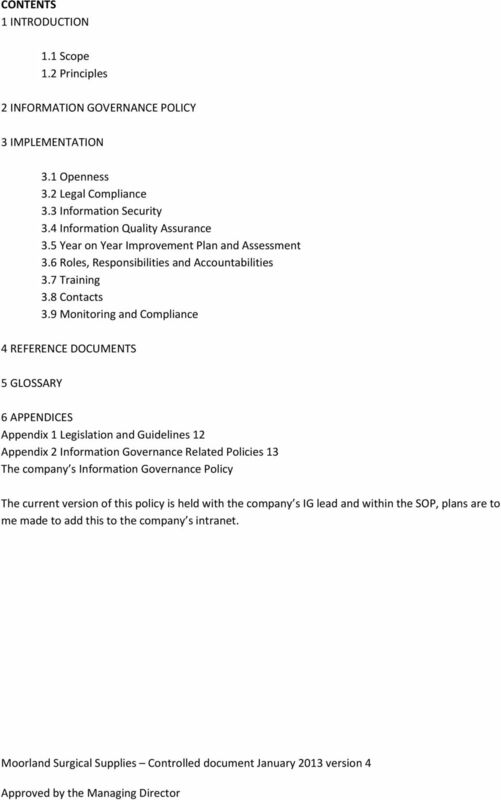 5 Further details of the company Information Governance framework are in section 3 of this policy. Details regarding company Information Governance obligations can be found in supporting policies (see Appendix 2) 3. IMPLEMENTATION` There are 4 key interlinked strands to the Information Governance Agenda. Openness Legal Compliance Information Security Quality Assurance 3.1 Openness Moorland recognises the need for an appropriate balance between openness and confidentiality in the management of information and its uses. Information will be identified and where appropriate kept confidential, underpinning the principles of Caldicott and the regulations and principles as outlined in the Data Protection Act (See Confidentiality Code of Practice Policy and Data Protection Policy) Non-confidential information held by Moorland will be available to the public through a variety of means to ensure compliance with the Freedom of Information Act 2000 and the Environmental Information Regulations (See Freedom of Information Policy) Patients have access to information relating to their own healthcare, options for treatment and their rights as patients. There will be clear procedures and arrangements for handling queries from patients and the public. 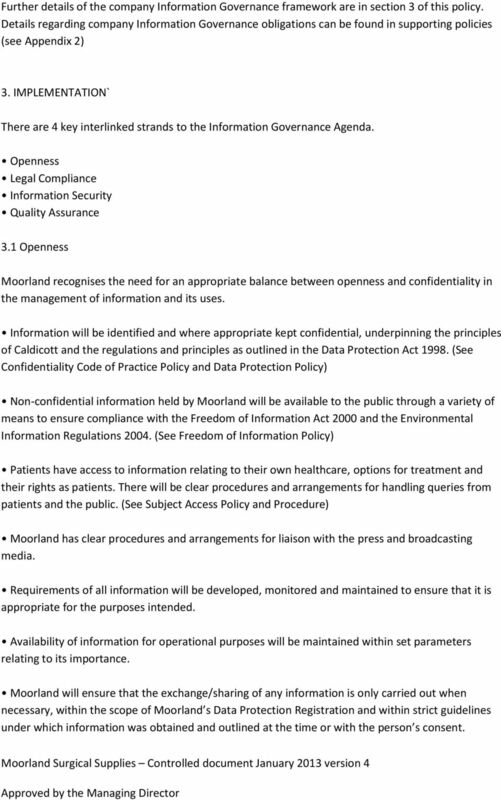 (See Subject Access Policy and Procedure) Moorland has clear procedures and arrangements for liaison with the press and broadcasting media. Requirements of all information will be developed, monitored and maintained to ensure that it is appropriate for the purposes intended. Availability of information for operational purposes will be maintained within set parameters relating to its importance. Moorland will ensure that the exchange/sharing of any information is only carried out when necessary, within the scope of Moorland s Data Protection Registration and within strict guidelines under which information was obtained and outlined at the time or with the person s consent. 6 Moorland has established and maintain policies and procedures to ensure compliance with the Data Protection Act, Human Rights Act, the common law Duty of Confidentiality and the Freedom of Information Act. (See Appendix 1 for all related legislation). Training in Information Governance will be given to staff to ensure they are aware of their responsibilities. Risk assessment, in conjunction with overall priority planning of organisational activity will be undertaken to determine that appropriate, effective and affordable information governance controls are in place. 3.2 Legal Compliance Moorland will undertake or commission annual assessments and audits of its compliance with legal requirements and/or provide the information to undergo these assessments of compliance. Moorland regards all identifiable personal information relating to patients and staff as confidential, except when law dictates otherwise. Moorland has established and maintains policies to ensure compliance with the Data Protection Act, Human Rights Act and the common law Duty of Confidentiality. 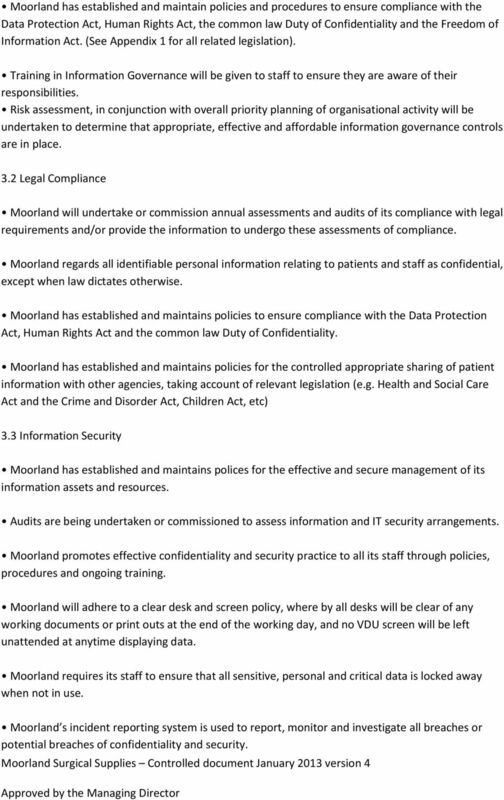 Moorland has established and maintains policies for the controlled appropriate sharing of patient information with other agencies, taking account of relevant legislation (e.g. 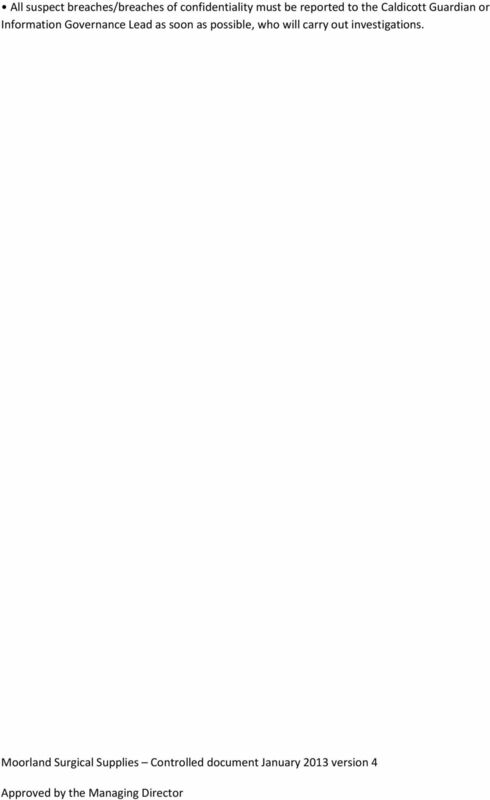 Health and Social Care Act and the Crime and Disorder Act, Children Act, etc) 3.3 Information Security Moorland has established and maintains polices for the effective and secure management of its information assets and resources. Audits are being undertaken or commissioned to assess information and IT security arrangements. Moorland promotes effective confidentiality and security practice to all its staff through policies, procedures and ongoing training. Moorland will adhere to a clear desk and screen policy, where by all desks will be clear of any working documents or print outs at the end of the working day, and no VDU screen will be left unattended at anytime displaying data. Moorland requires its staff to ensure that all sensitive, personal and critical data is locked away when not in use. Moorland s incident reporting system is used to report, monitor and investigate all breaches or potential breaches of confidentiality and security. 7 All suspect breaches/breaches of confidentiality must be reported to the Caldicott Guardian or Information Governance Lead as soon as possible, who will carry out investigations. 8 3.4 Information Quality Assurance Moorland has a policy for information quality assurance and the effective management of records. (Appendix 2) Audits will be undertaken or commissioned of Moorland s quality of data and record management agreements. Senior Managers will be expected to take ownership of, and seek to improve, the quality of data within their services. Wherever possible, information quality will be assured at the point of collection. Moorland promotes data quality and record management through policies, procedures/user manuals and training, in accordance with national standards. 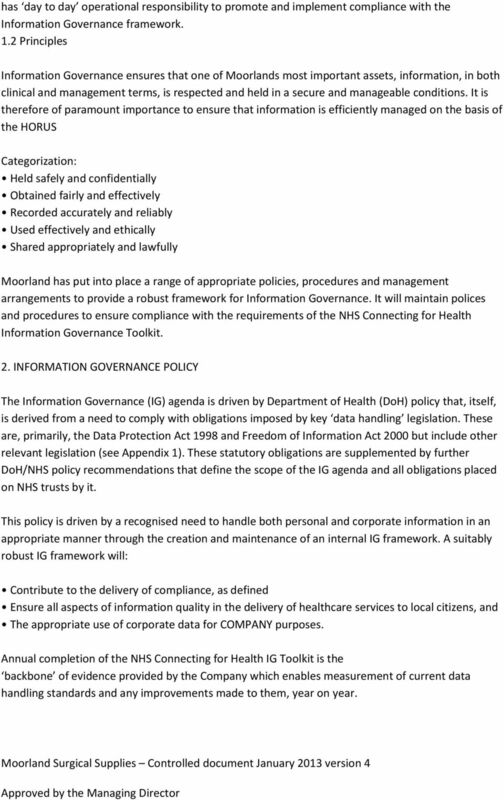 3.5 Year on Year Improvement Plan and Assessment The Department of Health requires Moorland to annually assess their performance in Information Governance against the Information Governance Toolkit. 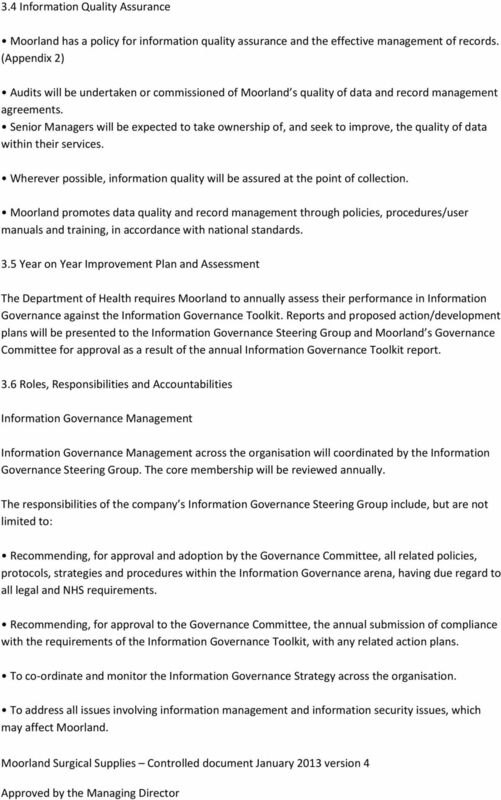 Reports and proposed action/development plans will be presented to the Information Governance Steering Group and Moorland s Governance Committee for approval as a result of the annual Information Governance Toolkit report. 3.6 Roles, Responsibilities and Accountabilities Information Governance Management Information Governance Management across the organisation will coordinated by the Information Governance Steering Group. The core membership will be reviewed annually. 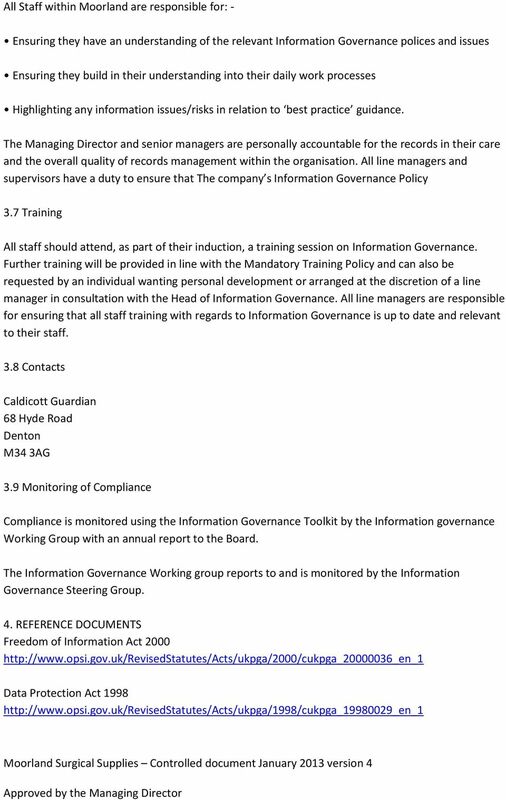 The responsibilities of the company s Information Governance Steering Group include, but are not limited to: Recommending, for approval and adoption by the Governance Committee, all related policies, protocols, strategies and procedures within the Information Governance arena, having due regard to all legal and NHS requirements. Recommending, for approval to the Governance Committee, the annual submission of compliance with the requirements of the Information Governance Toolkit, with any related action plans. To co-ordinate and monitor the Information Governance Strategy across the organisation. To address all issues involving information management and information security issues, which may affect Moorland. 9 To identify and approve all necessary staff information and training packages within the arena of Information Governance as outlined with the Information Governance Toolkit. 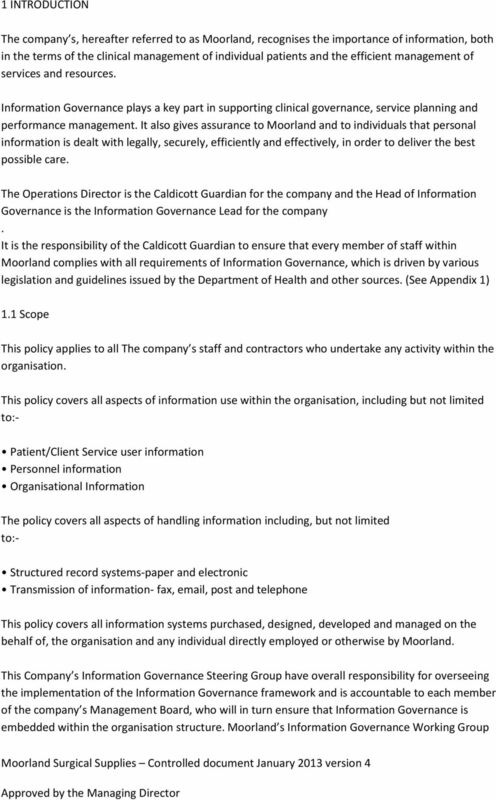 Roles The Caldicott Guardian for the COMPANY is responsible for:- Ensuring the safe recording, storing and retention of all personal data. Ensuring all information flows are mapped to exclude any leaks of information. Conducting any investigations which the Information Governance lead has brought to their attention. Negotiating, through delegation, all information sharing agreements on the behalf of the company The Head of Information Governance is responsible for:- Overseeing day to day Information Governance issues, Providing guidance to all staff, Developing and maintaining related polices, protocols, strategies and procedures within the Information Governance framework, Maintaining guidance, procedures and raising awareness on a constant basis to staff of all levels across the company Supporting and assisting the Caldicott Guardian or any member of the Trust. Carrying out any investigation any breaches of confidentiality, suspected or confirmed; and Reporting to the Caldicott Guardian or other relevant Director immediately any such issues are suspected. All Managers within Moorland are responsible for ensuring that:- The policy and its supporting standards and guidelines are built into local processes and that There is ongoing compliance on a day to day basis. Any breaches or suspected breaches of confidentiality or information security are referred for immediate investigation. Information Governance Strategy and Policy. 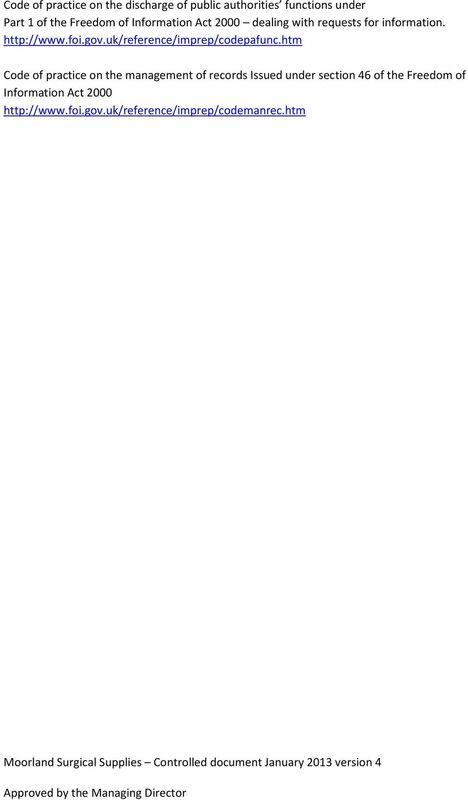 OFFICIAL Ownership: Information Governance Group Date Issued: 15/01/2015 Version: 2. Date of review: January 2016 Policy Category: Corporate Sponsor (Director): Chief Executive CONTENT SECTION DESCRIPTION PAGE. Job Description. Line Management of a small team of staff administrating and managing patient and professional feedback and incidents. Information Sharing Protocol South Central PCTs, General Practices and Tribal Consulting Limited Commissioning Enablement Service (Analytics) Document Control Date Version Author Comment 08/02/10 0.1 A.